Miguasha National Park is considered to be the world's greatest palaeontological record of fossils from the Devonian Period, known as the 'Age of Fishes'. Five of the six main fossil fish groups from this period (dating from 370 million years) can be found here. 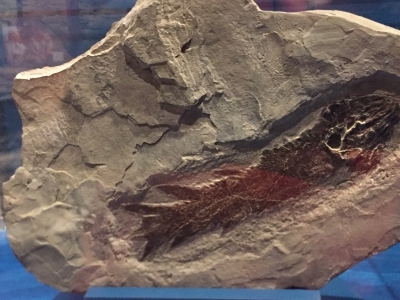 A great quantity of some of the best-preserved fossil specimens of lobe-finned fish, ancestors to the tetrapods (believed to be the first four-legged air-breathing terrestrial vertebrates), were found here. These coastal cliffs are made up of grey sedimentary rock (composed of alternating layers of sandstone and shale) which are 350-375 million years old. The area supports mainly birch, aspen and fir forests. Some of the fish, fauna and spore fossils found at Miguasha are rare and ancient species. For example, Spermasposita is thought to be one of the oldest flowering plant species on earth. The fossil site was first discovered in 1842, by Abraham Gesner (1797-1864), a geologist and medical doctor, and a pioneer in the petroleum industry. To date, over 5,000 fossils from this one site have been identified and categorized. Known as the smallest National Park in Canada, this site is a gem, and the Visitor Centre is beautifully organized. It is in a remote part of Quebec’s Gaspé Peninsula, and we stayed the night before in Carleton sur Mer, a resort area on a lovely bay near the park. This area is known for its extremely old fish fossils of the Devonian Period. Aside from the view, and wonderful exhibits, the geologists make the cliff tour interesting by leading the group on a discovery quest of looking for fossils. Using a tool to chip the rocks to uncover the hidden gems, and bringing a few back to a lab where a technologist cleans, enlarges, and identifies the pieces. This gives an in-depth understanding of the process. One hopes no precious things get damaged by amateurs, but the geologist does supervise carefully. Heads up to the friendly and helpful staff. This was a memorable site and would also be beneficial for older children, at least 12 years of age and up. There was no Tour provided in English on that day, but I speak French and somehow managed to follow the process better than I had expected. English tours are limited in frequency so book ahead as much as possible! 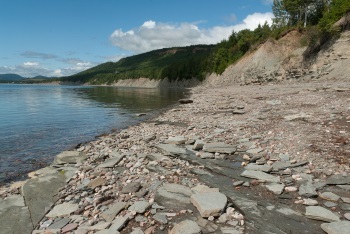 The Miguasha National Park is the smallest national park in Canada, covering small part of sea shore with attached forest on the southwestern part of Gaspe Peninsula. It was created to protect one of the most important fossil sites in the world. Entering the World Heritage Center tourists have three options - walk through the beach and the forest (approx. 7 CAD) or entering the museum (approx. 10 CAD) or of course both. I dare say that walk through the park is not worth money spent on it. The forest walk does not provide with any interesting views and unless you would like to repeat lesson of natural history (placed on several tables along the path) or look for mushrooms, you may skip it. The beach is a bit more interesting, although the chance to find any fossils there is virtually zero. It is just nice cliff and good (but common in Canada) sea view. In contrary, I definitely recommend visiting the museum. We may know much more about Miguasha history and why the site is so important. In fact, it is the most abundant devonian fossil site on Earth. In the museum you may find great examples of well-preserved fossils found in Miguasha and, to some extent, taken from other places. I was particularly interested in tetrapods, fossils documenting one of the most important milestones in evolution of life - coming from water to land. Although nice, I found Miguasha much less atractive than other Eastern Canadian fossil site - Joggins Fossil Cliffs. The tourists not interested in fossils may be a bit disappointed by this WHS. in Jacquet River at a location called "Viking Camp"
sceneries New Brunswick has to offer. I visited the park with some friends this summer (2005) and found it to a fascinating experience. Not only does the area have magnificent scenery, but there are plenty of hotels and restaurants where you will be served great food with great hospitality. It would be surprising if you were to walk the length of the beach and *not* find a fossil. The park employees and tour guides are great resources for information and the museum is laid out in an organized manner. You will leave Miguasha knowing much more about the history of the beach, the process of fossilization, our evolutionary past and the preparation of fossils. On a scale from 1-10 I give Miguasha National Park a full 10. Very interesting! Never imagined seeing some many fossils for the sea like we saw there. Miguasha is a remote park on southeastern edge of the Gaspe peninsula in Quebec but right on the border with New Brunswick. There is not much to see in the park but the museum is a visual pre-history lesson with lots of examples of the Devonian era fossils found at the site. Literally thousands of complete sea-life fossils have been found here and you can view the shale and sand cliffs where the fossils have been found but there is really not anything to see there. Most of the fossils are displayed in museums around the world but a few hundred are at the museum on-site. You must pay(C$8.00 in 2004) to visit the museum in order to make a visit to Miguasha worthwhile. Not many places to stay nearby. Drive about 30 km south for some small towns with motels.